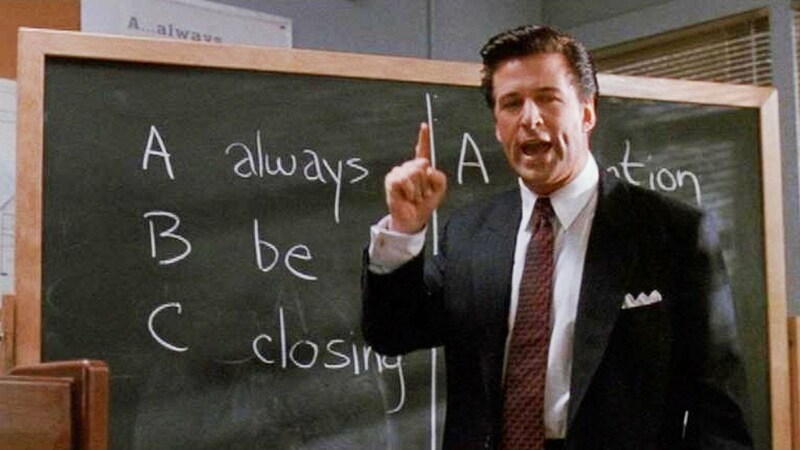 The line comes from his play Glengarry Glen Ross - and is delivered by Blake, a sales trainer working for a real estate company, who is brilliantly played by Alec Baldwin in the American adaptation of the play. He is a slick, accomplished sales guy earning large amounts of commission and training his team in his dubious sales tactics. It is the epitome of everything that led to the 2008 market crash. It might seem to some, like me, that Glengarry Glen Ross is more recent than 25 years ago, a time when its stellar cast, including Jack Lemmon, Al Pacino, Alan Arkin, Kevin Spacey, Jonathan Pryce, Ed Harris and Alec Baldwin, won many nominations and awards! But things change, markets move on and buyers have a very different and much more sophisticated approach to buying today. The worldwide web was a two-year old baby in 1992, Google did not even exist – it was founded in 1998. The high-pressure sell was an accepted approach and salespeople relished the power they had in any business transaction. It was a time when the sales guy called all the shots! The sales and marketing process has changed. Today and progressively over the intervening decades since then, the power has shifted to the buyer. The buyer’s journey is now often quoted as being well over 50% complete by the time he or she wants to engage with a salesperson. The product and services information is broadly available on the web, competitors can be readily researched, pricing reviewed, functionality and capability explored and in the consumer world, and even in some B2B markets, the purchase can be completed without ever even needing to meet or talk to the well dressed, expensively suited salesperson that Alec Baldwin typified. Why? And why do we even need salespeople? In 2017, there is still a clear role for people in sales, particularly in business-to-business transactions where complexities of products and services cannot just be selected from a tick-box list. There is a need to ensure that the customer gets and understands what they are buying and how it is going to be implemented. But the role of the salesperson has had to change with technology and the switch to a buyer-led process. No longer is it appropriate for the slick salesman to push a contract forward and say, “Push hard when you are signing as there are three pieces of carbon paper!” Most likely the deal will be closed electronically with neither party face to face as the contract is signed. So what is the role of the salesperson? They are still there to close a deal. They still have a monthly or quarterly business target to hit to ensure the business grows. They still need to know that revenues are delivered on time, so that the business can pay its people and its suppliers. Nowadays, the slick sales guy who is trying hard to ‘push’ the deal over the finish line is highly likely to lose out. The deal is much more likely to be walked over the line with the salesperson’s arm around the buyer’s shoulder, having gained their trust and shown their expertise, whether its technical or experience. The sales guy will have helped to build the case for the purchase and spent timeadvising and guiding the buyer to the final conclusion that they are the right supplier to work with. Helping the buyer becomes the key driver, the key attribute for a good salesperson. The salesperson must have the ability to talk to and understand the buyer’s needs and concerns. Clearly articulating how the buyer’s needs will be met by the product or service offered, as well as and how the deal can be structured to meet their budgets, timeframe and to deliver the benefits that the prospect has identified, is essential. Helping becomes the mantra for the marketing team and for the successful sales person. Helping prospects to solve their business problems; them from the initial moment of engagement through to the deal being signed. There are plenty of other suppliers out there that your buyer can choose, take the time to understand what it is that they want to achieve and help them to visualise how your company can deliver it. Think in terms like this and you’ll have a highly successful sales team who will win referrals to other prospects, from your customers, on a regular basis. Just because they are great people to do business with. It works for our businesses. Why don’t you try it? Tip #31: Shift your approach in sales away from telling the prospect how great you are at every opportunity. And start asking them how you can help their business to succeed!